WORCESTER —Missouri rotational grazier and carbon sequestration advocate Greg Judy told more than 1,000 conference-goers to treat animals right, and heal the soil. The mix will result in good food for humans, said Mr. Judy, the keynote speaker of the 28th annual winter conference of the Northeast Organic Farming Association held at Worcester State University Saturday. Mr. Judy runs a grazing operation on 1,580 acres of leased and owned land made from 15 farms. Mr. Judy, who does not use lime, fertilizer, seeding, chemicals or equipment, went from near bankruptcy in 1999 to paying off a 200-acre farm and house in three years. Seven years ago, he switched to what he called holistic high-density grazing. He said, “Unless we can stop this erosion of chemicals, and farmers being removed from the land, pretty soon were not going to have any farmers left. Mr. Judy said he has practiced what hes preached the last 10 years, but “did it wrong” for the prior 30 years with his conventional agriculture. “I was a mob kind of guy and once I got removed from the mob and started doing things differently, thats when things started to work well for me,” he said. The conference consisted of seasoned and beginning farmers, urban homesteaders, backyard gardeners and food activists. There were 70 workshops on crop production, farm management, health, homesteading livestock, beekeeping and other topics. In an interview, NOFA Massachusetts policy director Jack Kittredge said the organization is determined to get a bill passed by the state Legislature. It concerns the labeling of foods that are produced by living organisms whose genetic material has been artificially manipulated in a laboratory through genetic engineering. NOFA is part of a coalition consisting of Massachusetts Public Interest Research Group, MoveOn.org and Massachusetts Right To Know GMOs, which all aim to label those foods as GMOs, or genetically modified organisms. Mr. Kittredge said a bill last year garnered the support of about 140 of 200 Massachusetts legislators, but the effort did not have legislative leadership behind it, so it did not make it to the floor for a vote. 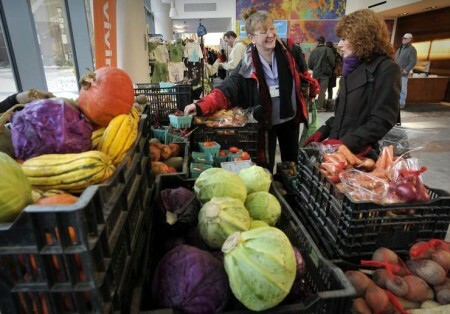 Read the full story via Organic farming both a growth and health strategy – Worcester Telegram & Gazette – telegram.com. ⇐ Can Organic Agriculture Feed the World’s Hungry?